It is so hard to know what to say. But not saying anything seems wrong somehow. I don't know. So here I go, doing my best to put what is in my heart into words, even though it will be so completely inadequate. There is no other way to begin than to simply say I loved Lisa. She was one of the most kind and generous, fun and funny friends I've ever had. I remember when she won the Morris award, I stopped everything and made cupcakes for her. She was the type of friend who deserved cupcakes! She loved coffee. She loved pie. Especially pumpkin pie with her coffee for a special breakfast. She loved blogging and the on-line writing community. She loved her husband of 20+ years. She loved U2 and frequently referred to Bono as her boyfriend. Actually, she loved music, period. In fact, she loved it so much, that when I asked her to go to a concert with me featuring one of my favorite bands, Lifehouse, who I think she could take or leave, she said, "Sure!" 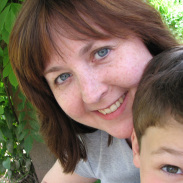 She loved her son so very much, and as the mother of two boys myself, we talked about our sons, and mothering to boys. She understood boys in a special way, and I think it's one reason why FLASH BURNOUT was so authentic in its voice. We shared the love of some TV shows. Project Runway, for one. As you probably know, she channeled Tim Gunn a few times on her blog. I think I commented on one of those posts that she did it so well, it sort of scared me. Then there was My So-Called Life, which of course, was on many years ago, but we'd still talk about it sometimes. After she read my WIP in December, shortly before she got her diagnosis, she asked me if my main character's name (Rayanna, Rae for short) was after one of the characters on My So-Called Life. It wasn't, until she said that. But then I said, "You know, I hadn't even thought of that. But I like it! So yeah, I'm going to go with it." And finally, Friday Night Lights. One of my favorite shows of all time. And I think she got fed up with me talking about it all the time, and telling her, you need to watch it, you need to WATCH IT! So one weekend, she Netflixed Season 1. And I can remember getting little texts and/or e-mails from her as she watched. She eventually watched the other seasons and was all caught up last year so she could watch Season 4 along with me. The last time I saw her, in January, I took her a Dillon Panther's t-shirt. 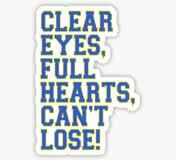 On the back it had their motto: Clear Eyes, Full Hearts, Can't Lose. Here's what I believe. Lisa lived that motto. She lived life with her eyes wide open, taking it all in. One of the last e-mails I got from her read, "Isn't it so pretty today? I'm sitting here watching the birds and the squirrels." And that was all. She just wanted to share that little moment with me. And it made me stop and take a moment to look outside, and take in the beauty of the day. And a full heart? Oh yeah, absolutely. She loved deeply. From friends and family to books and authors to music and bands to Europe and sunny beaches... I could go on and on and on. As far as the can't lose part? She wrote books, submitted them, and continued to submit them in the face of rejection because even though it hurt and it was hard, she wanted to see her dream come true. And thank God she did. I can still remember reading an earlier novel that was never published. I thought, dang, this girl can write. I knew it would only be a matter of time. And when I read FLASH BURNOUT, which made me laugh and made me cry, I knew it would be the one. She was so supportive of me and my books too. The thing is, though, it wasn't just me. She made a point of letting authors know when she'd read a book and loved it. She was so good at making that personal connection and doing everything she could to lift authors up. I try to do that, but she didn't try, she DID it. And it makes me want to work harder and be better about that. She understood how hard this business is and how much a simple note of encouragement can mean. Somewhere on Goodreads there is a lovely review of CHASING BROOKLYN where she talked about all of my books. I think it would make me too tearful, so I'm not going to go and look for it now. But in it, she said of all my books, FAR FROM YOU was her favorite. FAR FROM YOU tells the story of Alice, who is trying to adjust to a new life with her step-mom and new half-sister. Years before, Alice's mom died from pancreatic cancer. Yes, you read that right. Pancreatic cancer, the kind of cancer that took Lisa's life. These past days, I've found myself thinking of Alice, wondering if God put the characters of Alice and her mother in my heart to perhaps help me a little with Lisa's passing. There is a passage in FAR FROM YOU I want to share with you, where Alice is unconscious, and has a dream of sorts with her mother. "But Mom, I'm losing you. It's getting harder and harder to find you." "Honey, no matter where you are, I'm with you. When the breeze brushes your cheek, it's me. When the tulips bloom in the spring, that's me." Wednesday night, after a very sad day, my husband and I went for a walk. It was a cold and quiet night, and as we walked, it began to snow. Big, fat, beautiful flakes fell around us in the darkness. And a sense of peace washed over me. I will miss her so much. But I also know, she is with me always. As Alice realizes, her mom's greatest wish is for her to live a full life. To look for and find the joy everywhere. I know Lisa wants that for me too. For ALL of us. I thought I was done crying, until I read the quote from FAR FROM YOU. Thanks so much for sharing your thoughts and sharing your friendship with Lisa. This is so beautiful, Lisa. I write with tears in my eyes. Thank you for allowing me to meet this very special woman. I feel sure she is giving you a great review on this one! What a beautiful post -- thank you. LK touched so many of our lives with her books, tweets and posts. Thank you for this wonderful reminder of her kindness and generosity to so many of us book bloggers. Thank you for this lovely post. Lisa's legacy is her friendship. her work and the extension of her impulse to support and help others. I am so sorry for the loss of your dear friend. It was so nice to hear a little more about her. Lisa was awesome. She was funny (Yelling out "WRITER!" when I once told her I couldn't explain what my book was about...), encouraging (sending me an e-mail when my book was rejected by editors), and willing to say something (Are you SURE?) when I had to make a tough decision regarding said book. Thank you for sharing this with us, Lisa. I am crying, too. Hugs. I really don't have adequate words to respond to this beautiful post. So all I'll say is thank you for sharing it. If you lived closer I would bake you cupcakes. But all I can give is a completely lame ((cyber hug)) and warm thoughts and prayers. I know this was hard for you to do, Lees, but thanks for writing this. We needed to hear this from you and I love the bittersweet serendipity from FAR FROM YOU. Oh this made me cry. You are such a beautiful writer, Lisa. We are so, so sorry for your loss and wish we would have had a chance to know L.K. Thank you for sharing a bit of your friendship. This was absolutely beautiful. I grew up with Lisa Gray. She lived down the street and was my best friend throughout high school. She was a warm, wonderful and funny person. Lisa and I lost touch, reconnected and then lost touch again. She was an Angel who now has her wings. Lisa Schroeder, you were lucky to have known Lisa and connected with her. We were all lucky to have her in our lives. God Bless. Beautiful post. You have written a touching tribute to your friend. Somewhere, she is smiling because of your words. You really moved me...I have tears streaming down my cheeks. May memories of your friendship stay forever in your heart.